The Pakistani government strengthened its repatriation policy towards Afghan refugees, with more than 600,000 people forcibly returned from last year. 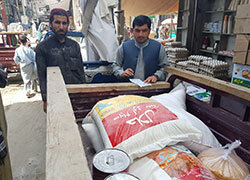 According to a survey that AAR Japan conducted on 3,800 households in the Nangarhar province of Afghanistan, from the end of February to March more than half of respondents were in need without any aid. AAR is distributing emergency relief supplies to these people. The local government ordered the Babo Gulu’s family to leave their house immediately after the repatriation policy of the Pakistan government was strengthened last year. They were not given any time to prepare. They scraped the cost to return home somehow by selling household goods, and managed to get to Afghanistan half a year ago. They said that they have hardly any money. In our interview with 3,800 households, we found that the returnees face difficulties in many areas such as where to live, food, education, medical care and so on. We decided to hand out relief supplies to 580 households, especially to persons with disabilities and families where the woman is the head of the household and who have not received any assistance. Tickets for solar panel sets (solar panel, charger, lamp, etc.) were distributed to all these households. As for the others supplies, the items that they already have differed depending on the household, so we distributed coupons so that they can purchase what they need by themselves. As soon as the coupon distribution was over in March, people who had coupons purchased food and daily goods at a local store from April 1st. These coupons could only be used at stores that AAR contracted with and the goods that they can purchase are limited to goods that are indispensable for living, such as food, soap etc. 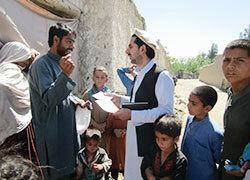 Spring is coming and it is expected that the number of returnees will increase further. In addition, many people are still left without any support. We would be grateful for your continued co-operation with emergency donations.